One sip of Pennsylvania rye reminded me that in pre-Prohibition New York, the whiskey in your cocktail was likely very different from the Kentucky-style rye we’re most familiar with these days, like Rittenhouse or Sazerac or Overholt—the ryes I was using in that previous post. The whiskey a Brooklyn drinker encountered a hundred years ago would have been Maryland or Pennsylvania rye, long on barley and malt, perhaps some corn in the Maryland product; more fruity, spicy, and grainy, and often younger and less oakey than modern rye whiskies. There aren’t many examples of that whiskey around these days. (David Wondrich recently described why they disappeared here and here.) Leopold Bros. has a Maryland-style rye, and Dad’s Hat has a handful of bottlings of Pennsylvania-style rye available in a few markets. These whiskies, the Maryland and the Pennsylvania (sometimes called “Monongahela”) ryes, present themselves very differently from western, Kentucky-style ryes. The flavor of a Pennsylvania or Maryland rye lies somewhere in the middle ground between Scotch and Bourbon. If we make a Brooklyn Cocktail with these ryes, but using the proportions we worked out for western ryes in the previous post, we get a very different, and not very good, whiskey-heavy mishmash of a cocktail. The nose is all about barley malt, with very little of the cherry scent that the western ryes encouraged. The initial taste is drier, and much more dominated by the whiskey. Maraschino and Ramazzotti add sweetness, but aren’t particularly identifiable. The aftertaste is barley malt, whiskey, and faintly cherry. Clearly, the change in flavor profile means that a Brooklyn based on these Eastern ryes needs a completely different formula from the one we published last time. And here’s where the history of the Brooklyn comes full circle. Jacob Grohusko’s original formula specified equal parts rye whiskey and Italian vermouth—a mixture that we noted (last time) seems far too sweet—but then we were mixing with western ryes. 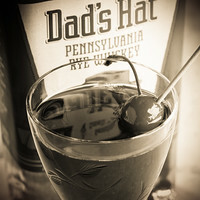 If we use a good Pennsylvania-style rye—for example, Dad’s Hat 90 proof—the balance changes, and the original one-to-one formula is very close to perfect. What seemed at first glance to be a very sweet cocktail in the style of the Golden Age turns out to be balanced and subtle, and very much in line with the drier tastes of the 21st century. Stir with ice until very cold. Strain into a small chilled cocktail stem. Originally served without garnish, but a cherry is an appropriate decoration. 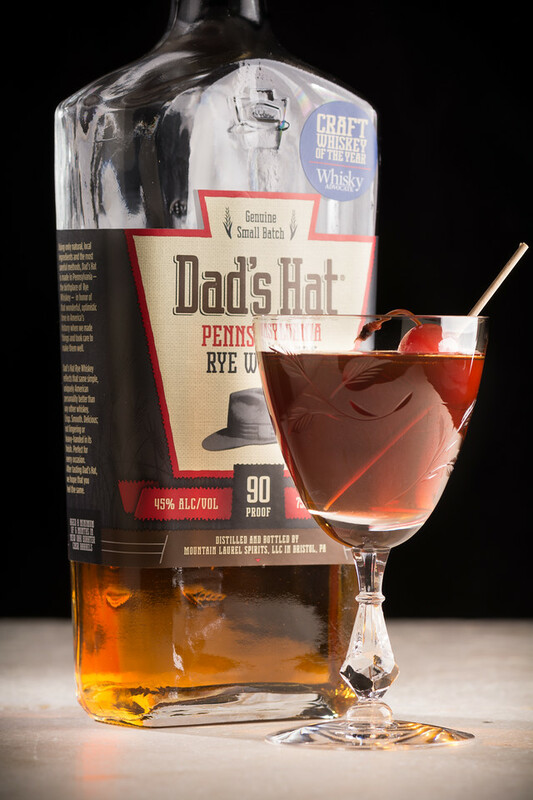 The Dad’s Hat Pennsylvania Rye is a young, 90-proof (45% ABV) whiskey made with 80% rye, 5% malted rye, and 15% malted barley. With such a high percentage of malt, and particularly the unusually high percentage of malted barley, the flavor sensation is much drier than Kentucky-style ryes; I’m no chemist, but I suspect that the high portion of malt is the element that ties together the whiskey flavors and the large proportion of sweet vermouth so elegantly, and keeps the sweetness of the vermouth under control. This formula ups the portion of Maraschino a bit. A half-ounce is certainly a far cry from Grohusko’s original “dash,” but I think it blends well here if your Maraschino isn’t too sweet, and it helps the cherry scent and flavor to cut through the large proportions of whiskey and vermouth. Which gets me thinking about a comment Fred Yarm left on the previous post, about preferring a mellow rye (like Old Overholt) to a more fiery one (like Rittenhouse), because the softer ryes allow the maraschino and amer flavors to express themselves better. That suggests why a Monongahela-style rye works better in the Brooklyn than the Kentucky-style ryes. And while Fred and I don’t see eye to eye on this (yet—maybe I just need to find the right whiskey) when the discussion is purely about Kentucky rye options, Pennsylvania rye whiskey changes the game entirely; the softer (and maltier) profile of the Dad’s Hat makes all the difference in the Brooklyn, so much so that it’s unlikely I would ever make one again with a western-style whiskey. All of that notwithstanding, current reality is that Monongahela and Maryland ryes are available in only a few markets, and for many, perhaps most, people reading this post, the western, Kentucky-style rye is the only whiskey available. Given that reality, the formula from the previous post gets pretty near to the most realistic Brooklyn Cocktail you’re likely to make at home. But if the Dad’s Hat 90 proof or other Monongahela or Maryland rye is available in your market, you owe it to yourself to give it a try. A Brooklyn made with high-barley, high-malt rye is a completely different, and in my opinion, completely superior cocktail. If any cocktail can challenge the Manhattan for dark, round “whiskiness,” this is it. “Repairing the Brooklyn Cocktail, part 2″ at cold-glass.com : All text and photos © 2018 Douglas M. Ford. All rights reserved. Thank you, Jim, that’s very uplifting. I don’t know when I’ll get to Seattle, but would love to raise a glass with you. Thanks! Another excellent post on what I always think of as “grown-up” cocktails. I’ve tried making a Sazerac before, but didn’t use the rye whiskey, which was a mistake. After reading your post, I am inspired to buy a bottle of rye whiskey now, and experiment with this drink and with my previously-failed attempt at the Sazerac. Thank you! Yes, the Sazerac does love its rye whiskey. And pretty good with a good brandy, too. Inspiration is good! Hi Doug, what do you suggest when there is no Rye available? Thank you, salud. The standard substitution would be a high-rye bourbon, like Four Roses Small Batch (one of my favorites), Old Grand Dad, Bulleit, or perhaps Woodford. I’ve not tried a Brooklyn with Bourbon, and I suppose I should one day; I would expect the drink to seem sweeter, as is usually the case with bourbon, so I’d likely reduce the proportion of sweeteners added to the cocktail—so lighter on the sweet vermouth and Maraschino for starters. Thanks for the question, I like things that take my thinking in a new direction. Oh, I do love me a cognac-based Sazerac! one or two dashes of Peychaud’s bitters. Give it a try! It also needs a name. Hmm, I’ve found a fairly similar drink on Punch, called the Casualty. Made from 1.5 oz blended Scotch, 3/4 oz Montenegro, 3/4 oz Byrrh and 2 dashes chocolate bitters. I don’t have Byrrh so I made it with Dubonnet instead. Another nice drink. Long-time subscriber, first comment & also a question. I really like your writing and your photographs make it. Question: I didn’t think I’d particularly like bourbon as I usually drink Barbancourt Rhum. However, I am now hooked on the Green label Bulleit rye. I never had a Sazerac. Would this make a good one? I only drink the Bulleit on ice, so far….wanting to branch out. Hi, Kathy, sorry for the delayed response. Thank you for the compliments, I’m glad you enjoy Cold Glass. So you’re turning into a whiskey person, eh? Excellent. The Bulleit Green Label would make a fine Sazerac, I recommend that you give it a try. Branching out with the classics is always a good idea. Thanks for reading, and for the question. I’ve seen a lot of good press for Wigle, but, alas! they don’t sell it here (yet). I hope that goes well. Just tried it— with the Wigle rye and CioCaro with the Cocci vermouth and Luxardo maraschino. A little too sweet for me (but delicious nonetheless)— I love ‘em dry and boozy, so next time I’ll dial up the rye, dial back the vermouth and maraschino. Thanks— I have always been intrigued with the Brooklyn and love your take on it! !